Sponsor A Page On Georgetown County Directory! 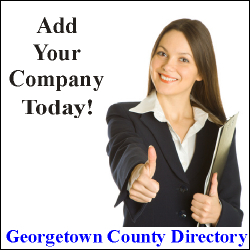 Thank you for your interest in Sponsoring A Page on GeorgetownCountyDirectory.com! Less than $8/month for sponsoring a page is a small price to pay for being part of and linked-in to a large network like we are! Don't forget that we are partnered with many websites and networks including BusinessAtTheBeach.com, OnTheGrandStrand.com, HorryCountyDirectory.com, ConwayLiving.com, DirectoryMyrtleBeach.com, and many many more! We will run your 250W X 250H image with a direct link to your website! Need an Ad? Well guess what! As a special service our editor, Joey O'Connor, thru his pr/marketing/media avenues on Joey O'Connor Enterprises, will MAKE A FREE AD FOR YOU! Once you complete the submission process below, he will make a 250x250 image ad for you to use with us here on Georgetown County Directory! Check This Out! --- We will also give you extra targeted exposure by "sharing" the news of your new page sponsorship on ALL of our social media accounts!! LinkedIn... Twitter... Google+... and of course our ever popular Facebook Page! And our editor, Joey O'Connor, also shares it on his personal pages too! Many of our previous shares about new profiles or page sponsorships have been reached out to 600-1,600 people in just the first 48 hours alone! Please Note: Company running ad must be located in/around South Carolina, North Carolina, Georgetown County SC, Horry County SC, and/or service these areas. Absolutely NO adult content, NO ads of offensive content, and NO job site related ads allowed.